The new Sony Cyber-shot DSC-RX10 is a bridge-style compact camera with all of its settings proverbially pushed up to MAX. Sony have truly gone to town and created the most full-featured, best-performing super-zoom that we've ever reviewed, and importantly one that delivers the best image quality too. That does come at a literal price, though, with the eye-watering $1299 / £1049 cost of entry sure to put off most casual users. Still, if you want an all-in-one camera that can almost handle anything that you can throw at it, the Sony Cyber-shot DSC-RX10 is definitely worth a look. The 20.2 megapixel sensor in the DSC-RX10 provides fantastic results from ISO 100-3200, with only the faster settings of 6400, 12800 and especially 25600 suffering from too much noise and smearing of fine detail. Chromatic aberrations are very well controlled and colours accurate, and the fast 8.3x lens is great for achieving that shallow DSLR-like depth-of-field and using the camera in low-light conditions. The headline grabbing f/2.8 constant maximum aperture makes it easy to throw the background out of focus throughout the range, especially at the telephoto focal lengths, although it can't quite achieve DSLR-like levels of bokeh. 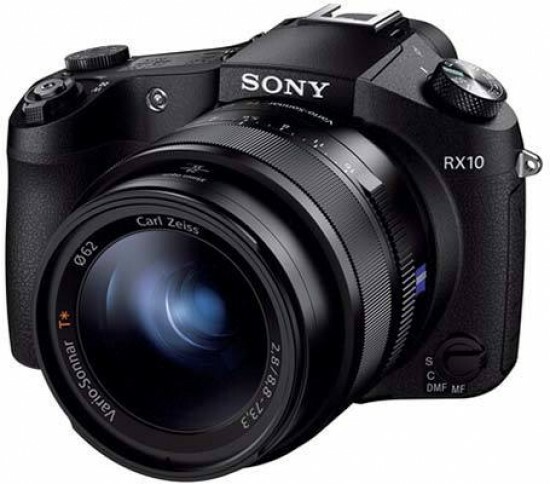 The RX10 is quite a big and heavy camera, a natural result of the 1-inch sensor and fast lens combination and the stellar build quality, although it's still more compact than a CSC or DSLR with comparable lenses. The inclusion of the multi interface shoe, multi terminal and built-in wi-fi/NFC make this one of the best connected and most versatile Sony cameras to date, making it straight-forward to share your photos and remotely control the camera itself, while the veritable wealth of videographer-friendly features add to the camera's versatility. The tiltable LCD screen is a nice feature, as is the excellent EVF which is good enough to use in place of the LCD screen if you so wish. The only major feature that we expected to see included on this new model is a touchscreen interface - maybe next time - while the zoom mechanism takes a while to go through the full range, and the Click switch on the bottom of the lens barrel proved far too easy to accidentally move.